this is a spiritual path which offers a radical view of wholeness ~ of spirit and matter as One. fully lived and made actual through the unique expression of each woman. of embodied awakening, we are also taking our seat in a timeless circle, The Yogini circle. not as another ego structure, but as a place of undeniable dignity and spiritual authority. Chameli has been traveling extensively meeting and practicing with Yoginis all over the world. order to bring these teachings forth, not as dusty dogmas but as an alive and evolving path of awakening. :: These classes are useful for all women who feel drawn and want to learn more about this path. of the potential of the practices and the path. the path and what it has to offer. :: what is a Yogini? :: You register by paying via Paypal below (contact us if you want to pay with U.S. check). :: As soon as you have paid, you will receive a Welcome letter with more information. :: How is this different than the 21 day Yogini Sadhana immersions? you a more extensive understanding of the Yogini path practiced in the Awakening Women community. that is not the focus of this program. :: How much time should I be prepared to spend for daily practice? a less intensive way. Just to listen to the classes will be beneficial in itself. have into this path. For some that will mean 10 minutes a day, for others it is 40 minutes or more. 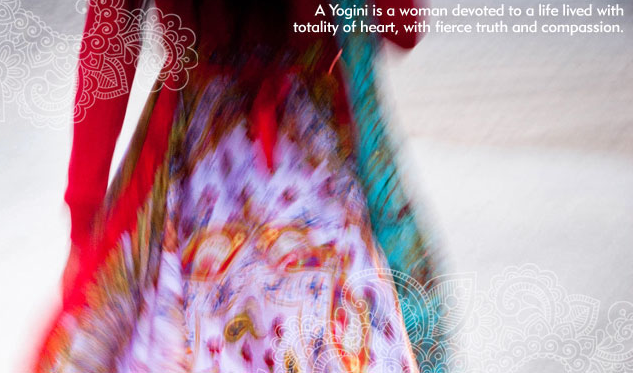 “My passion and mission is to gather women with the timeless Yogini Circle. I am traveling and meeting with women in many different countries. We are also meeting online in Sadhana intensives, and when I am home in Northern California I practice myself in the Women’s Temple. This circle is my satguru, it is my home, it is my sisters, it is my mother and it is my most important teacher. A Yogini is a word used to describe a feminine spiritual practitioner. The practices we explore in the Yogini circle challenge us to move fluently between the esoteric and the highly practical realms. We are asked to question the concept of a split between spirit and body, between the holy and the mundane. Where is the red dotted line? The Yogini circle is the bridge across the tormenting schism between spirit and our aching humanness. It rips away the fog, the dusty old concepts, the plastic spiritual food, and invites us to feast at the table with the Goddess herself. Why would I settle for anything less than that, when she is RIGHT HERE. Only a breath away. Not even. The circle has birthed me into real womanhood, it has given me infinite roots in all directions. I have surrendered into the flow of giving and receiving, giving and receiving, and in that flow I have had a taste of real sisterhood. Trust. Strong, brave, clear, beauty. The circle reminds me to dance, to shake, to howl. I am ripped open, I am recognized, I am awakened. It stretches me, massages me, slaps me, tickles me, nurses me, pushes me, and it holds me tight, tight through it all. The circle has swallowed me, chewed me, digested me, composted me, and spit me out. Re-born, helplessly in love. The focus of the practices are embodied awakening, embodied love, to be an instrument of awakening in this world.